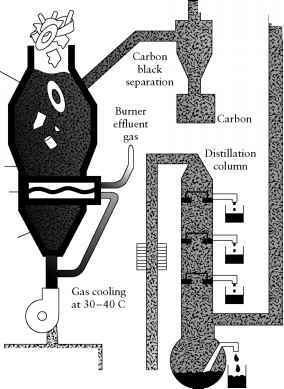 Gas-cooled (C02), graphite-moderated reactors (GCRs) using natural uranium and a magnesium alloy (Magnox) as cladding and advanced gas-cooled reactors (AGRs) using LEU fuel (U02) have been used in power plants in the United Kingdom for many years. These power plants, which generate steam, operate at higher temperatures than do LWRs. A different type of graphite-moderated, high-temperature, gas-cooled reactor, the HTGR, has been studied in Germany and in the United States for many years. Pressurized helium was the coolant. Uranium carbide (UC2) or oxycarbide (UC0) initially containing 235U in the form of coated microspheres was the fuel, and coated microspheres of Th02 served as fertile material for the production of fissile 233U by reaction (13-45). Eventually, such a reactor would operate on the 233U-232Th fuel cycle. The helium transferred heat from the core to a steam generator at a temperature of about 700°C, providing a higher thermal efficiency than that for an LWR. Further improvement of efficiency was planned by going to a gasturbine cycle. The core of the HTGR was very different from that of an LWR. It consisted of an assembly of hexagonal graphite blocks containing vertical holes through which the helium could flow and holes for rods containing the microspheres, coated with a layer of graphite, a second coating of silicon carbide, and another coating of graphite. Fission products were retained in the micro-spheres by the coating. A demonstration or prototype reactor (40 MWe) was built in Peach Bottom, Pennsylvania, and a second commercial 330-MWe plant, built at Fort St. Vrain, Colorado, operated with many outages for mechanical problems for about 10 years beginning in 1979. Development of the HTGR in the United States was terminated in 1994. Two HTGRs operated in Germany have been shut down. The reason for describing the HTGR is that the concept has been revived in South Africa, where the pebble bed modular reactor (PBMR) is being developed. As designed, the reactor is cooled by helium that leaves the reactor at about 900°C and generates electricity through a direct-cycle gas turbine. Each module has an output of only 110 MWe. The core contains about 400,000 pebbles (about the size of tennis balls), each of which contains about 15,000 seeds of enriched uranium as U02 coated with layers of carbon and silicon carbide. The steel vessel containing the core is lined with graphite. The design allows spent fuel to be removed from the bottom of the core (into storage below the reactor) and new fuel to be added at the top without shutting down the reactor. A small (10-MWt), helium-cooled, pebble bed reactor began operation in China in 2000. It is designed as a source of process heat for industry and a source of electricity.